Seaweed farming dates back to the 1600's in Tokyo Bay Japan, however, seaweed farming in United States is a relatively new trade. In 2006, Ocean Approved became the first people to start farming kelp in the US. Since then, many other kelp farms have sprouted up across our coasts. We took the liberty of gathering up 5 of these awesome farms and sharing them with you! Ocean Approved has been the leaders in sustainable kelp farming. They believe in food being "Healthy for You, Healthy for the Environment". In addition, by farming kelp, they can create jobs for fisherman in the off season. Supporting Maine's coastal community and culture is one of their many positive driving points. On their website you can also find amazing kelp recipes, information about sustainable farming and nutritional benefits of kelp! Ocean Approved is currently selling kelp for wholesale off their website: www.oceanapproved.com Check them out! 3. Thimble Island Oyster Co.
Thimble Island Oyster Co. is located in Connecticut! This kelp farm takes a unique approach when growing kelp - they use a technique known as 3D Ocean Farming. Thimble Island Oyster Co. is one of the first sustainable 3D ocean farms in the country. They use a vertical growing system to grow a variety of species — ranging from sugar kelp and oysters to mussels and scallops. Their way of growing is now national model for hyper-local sustainable food production, ocean restoration and economic development. Check out more on their website: Thimble Island Oyster Co.
Maine Fresh Sea Farms was started by three entrepreneurs seeking a way to responsibly grow and harvest seaweed from Maine’s coastal waters. Their current mission is to provide a test lab for sea vegetables that were grown in a sustainable manner so that the process could be duplicated up and down the coast. Maine Fresh Sea Farms grows a variety of sea vegetables, all of which have amazing health benefits! They also supply a handful of delicious-sounding sea vegetable recipes that you can check out here: Recipes! We hope you learned a bit more about some of the kelp farms on the east coast! There are currently farms sprouting in the Alaska area and we hope to share more information about that with you soon. Until then, go grab yourself some kelp and support these wonderful farms! Kelpie vs. Kelpy vs. Kelpie: We're Here to Clear Things Up! So we're here to tell you a little bit about each! A Kelpie is a shape-shifting water-horse that is part of Scottish folklore. Most large bodies of water in Scotland have an associated Kelpie tale to go with it - the most common is the Loch Ness. The Kelpie can take the form of a horse or a human. This causes Kelpie tales to have very cautionary messages about appearance. Kelpie stories were also used to warn children of the dangers of the water. Additionally, Kelpie stories were also used to warn young women to be cautious of good-looking men - the Kelpie's most common human form. Want to learn more about Kelpies? Check it out here! A Kelpÿ Chip is a delicious and nutritious chip made from our ocean's very own kelp! These chips are a proprietary mix of ingredients - the main ingredient being kelp. Kelpÿ Chips not only have tons of health benefits for humans, but they have great benefits for Mother Earth! Sustainability is a hot topic now more than ever and Kelpÿ Chips aim to increase people's awareness about kelp and kelp-related products. Stay tuned for future blog posts about awesome kelp things! Look at the cute doggo! This right here is an Australian Kelpie! The Australian Kelpie is a great herding dog and they are used to herd livestock in Australia, Canada, the United States and many other parts of the world. It is said that they are a cross breed between a collie, other herding dogs and possibly dingos. They are extremely intelligent and have high energy so they work best with a task at hand. Thinking of getting your own Kelpie? Check them out here! Hope we cleared up any Kelpÿ confusion for you! Until Next time! Absorbent and yellow and loves Kelpy! 1. 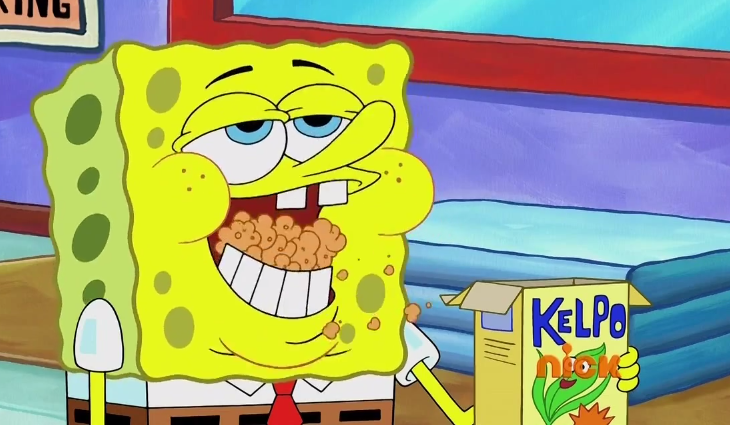 Spongebob clearly loving his morning fuel - Kelpo - the kelp breakfast cereal! Nom nom nom. 2. Spongebob trying to convince Mr. Krabs that Kelp Shakes are the bees knees - Come on Mr. Krabs...you know you want to try it! 3. Spongebob waiting for his precious Kelp Nougat Crunch Bar to vend. Hehe. 4. Spongebob looking lovingly at the carton of Kelp Milk in his fridge - What could go better with Kelpo than Kelp Milk?? 5. Last but not least, Spongebob and Patrick enjoying the love of their life - their pride and joy - KELP CHIPS!! That's all folks! Hope you enjoyed some Kelp related fun!